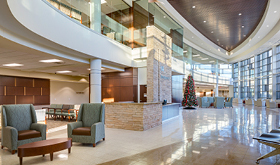 Awarded through a competitive bid process in March 2013, US Federal Properties (USFP) provided development services for the 153,000 square-foot, two-story, LEED Silver Certified Department of Veterans Affairs (VA) Health Care Center in Montgomery, Ala. Located at the northeast corner of Chantilly Parkway and Ryan Road, the clinic offers quality medical care to veterans throughout the region. Since its completion in July 2015, USFP has been providing the clinic with property management services. Nestled in the surrounding natural landscape and designed to create a relaxing, healing environment for veterans and their families, the building features a curved entrance, expansive glass walls, scenic lobby views and patios that integrate seamlessly with the natural site features. All waiting areas and most work spaces have access to natural light and views of the panoramic setting, which help minimize the use of artificial lighting and energy resources. Inspired by the vision of creating a park-like setting, the exterior design and finishes reinforce the notion of a spa-like, healing environment. The use of sun shades, translucent panels, skylights and materials that possess an organic ambience such as stone and energy-efficient glass are wrapped in warm metal-clad colors. 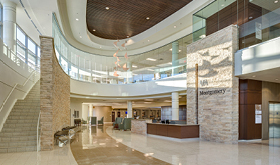 Compatible with its natural backdrop and the beauty and healing properties of nature, the Montgomery Health Care Center is an inspiring and dynamic place of quality care, healing and positive restoration for our nation’s veterans.